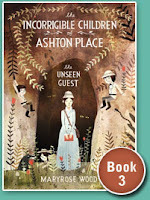 I am definitely a fan of Maryrose Wood's books, The Incorrigible Children of Ashton Place. The serial plays off a number of my favorite types of childhood reading. My favorite book in the series is the second, which I never blogged about, though I've just finished Book 3, The Unseen Guest. These are very sophisticated books with historical and literary references that will be as entertaining for readers who get them as pop culture references are for those who stay on top of that. Notice I called The Incorrigible Children of Ashton Place a serial. Each book has a separate thing going for it--Book 1 introduced the situation, Book 2 took the wolfie children and their intrepid governess to London, and Book 3 deals with the Victorian fascination with the dead and contacting them. But there definitely is an overall story we're dealing with. Who are the three Incorrigible children? Were they brought up by wolves? If so, what kind of wolves would take in children? Did a human help them out in the wild? If so, who was it? What's with Lord Fredrick who took them in and pays for Miss Penelope Lumley to care for them? What happened to Miss Penelope Lumley's parents? These books illustrate a frustration with even the best serials--readers have to wait for the next installment and by the time it comes, how much can they recall of earlier books? The best way to read a serial, I suspect, is after the entire story is done. Years from now, I see some young Gailish person going to the library to pick up another Incorrigible book. Or perhaps s/he will wait for the e-book to become available for download to an e-reader.